We love to eat out as a family and typically hit one of our favorite restaurants once a week. We love a lot of local places, but most of them have identical kid's menus. Chicken fingers and french fries, hamburgers and french fries, and macaroni and cheese that comes out of a box.When BlogHer asked if we wanted to head to Olive Garden as a family, I was more than happy to take my kids out to dinner for some yummy Italian-inspired food. The restaurant has a comfortable, kid-friendly atmosphere, and I am pretty much in love with their kid's menu. My two picky girls love that they can create their own pasta bowls, and I love that there are no french fries on the menu. Both of their meals came with fruit, and all of the kids enjoyed the yummy, unlimited salad and breadsticks before their meal arrived. A fruit and a vegetable from the kid's menu, imagine that! The games on the kid's menu were pretty fun too. I may or may not have picked up a few new Italian words. We also love their kid-friendly, non-alcoholic drink options. It makes dinner extra special for the kids when they get a fun drink, too. Olive Garden offers Italian and Cream Sodas, Berry Acqua Fresca, Frullato Smoothies, and our choice this trip, the Strawberry-Mango Limonata. Lou may or may not have had two. As for the adults at the table, I tried their new Baked Pasta Romana with Chicken, and my hubby went the beef route with the Steak Gorgonzola-Alfredo. Both were delicious, and there were plenty of leftovers for lunch the next day. In fact, I am pretty sure we left with just as much food as we ate while we were there. I even packed the kids' leftovers in their lunchbox the next day, including a little Limonata in Lou's thermos. 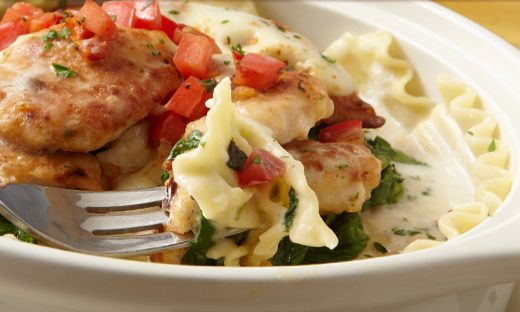 Olive Garden's new dinner special is a 3 course Italian dinner for $12.95. It includes soup or salad, your choice of 5 new entrees, and one of their Dolcini desserts, perfect for a date night without the kiddos. You can check out the 5 dinner options at Olivegarden.com/specials, and at that price you could get a couple of dates out of a $100 Olive Garden gift card. Would you like to win one? To be entered for a chance to win, check out Olivegarden.com to explore the full menu and find a restaurant near you, and then leave a comment letting me know what item you would like to try off of their menu! Rules: No duplicate comments. You may receive (2) total entries by selecting from the following entry methods: a) Leave a comment in response to the sweepstakes prompt on this post b) Tweet about this promotion and leave the URL to that tweet in a comment on this post c) Blog about this promotion and leave the URL to that post in a comment on this post d) For those with no Twitter or blog, read the official rules to learn about an alternate form of entry. This giveaway is open to US Residents age 18 or older. Winners will be selected via random draw, and will be notified by e-mail. You have 72 hours to get back to me, otherwise a new winner will be selected. The Official Rules are available here. This sweepstakes runs from 1/23/12 - 3/18/12. Also, visit the Olive Garden page on BlogHer.com to check out the other blogger reviews and more chances to win! Disclosure - This is a compensated review from BlogHer and Olive Garden. All opinions expressed are my own. I'd want to try the creamy Parmesan portobello fettuccine. as much as I love all the yummy pastas and such, it is the salad (extra olives please!) that I truly love! I want to try the Shrimp Mezzaluna. It sounds delicious! I would want to try the 5 cheese marinana penne with shrimp! The 3 course meal for only 12.95 is fabulous! First course salad and Chicken and gnocchi soup. Course 2 is Spagehetti with 4 cheese. dessert chocolate cake! Yum! The Smoky Mozzarella Chicken! And Tiramisu! I love the Olive Garden, especially their salad! I want to try their eggplant parm! I want to try the Steak Gorgonzola Alfredo! Chicken marsala all the way baby! The Steak Gorgonzola Alfredo looks amazing! the baked pasta romana with chicken looks delicious. I'd definitely give that one a try. Love their salads too. I would love to try that new parm fettuccine, yum! Love Olive Garden! Their bread sticks and salad are my favorite! The three course Italian dinner sounds so good too! The lasagna fritta sounds really good! The creamy Parmesan portobello fettuccine looks amazing! The grille shrimp caprese looks so yummy. I'd like to try the Seafood Alfredo. Oooh, the smoked mozzarella chicken sounds yummy! My favorite is the Chicken Marsala, but I would love to try the Steak Gorgonzola-Alfredo! Olive Garden is my all time favorite! I don't think I could go wrong with any of the choices, but one thing I haven't tried yet that looks delicious is Lasagna Rollata al Forno. Yum!! I would like to try the Smoked Mozzarella Chicken! YUM! Im a huge olive garden fan!Id love to try their new Ravioli di Portobello!! The Tour of Italy, for sure - it's got a little bit of everything and all of my favorites!! I would choose the Stuffed Chicken Marsala :)or Lasagna Fritta and of course the breadsticks and salad are to die for!!! I would for sure take all 7 of my family out to get the dinner special. A great family night out and it would only cost us maybe $15- you can;t beat that! Out of everything, I want to try the Chicken & Gnocchi Soup. I have heard SO much about it and apparently it is like the best upscale chicken and dumpling soup ever. I'd have the Smoked Mozzarella Chicken with a salad and Chocolate Mousse. Thanks for the chance to win! I love Olive Garden! I would like to try the Mussels di Napoli and the Ravioli di Portobello. Of course I would start with the garden salad and the soup and finish with the lemon cream cake. YUM!!! I love their Zuppa Toscana, but the Ravioli di Portobello looks really tempting, too. The smoked mozzarella chicken looks yummy! I love their pasta and meatballs! The $12.95 is a great deal! I think I'll have to try the Smoked Mozzarella Chicken dish! This is great! We love the salad and bread sticks. Especially to dip the bread sticks in the salad dressing. I'd also love to try anything new! 5 cheese marina penne with shrimp sounds amazing. But nothing is better than that salad and breadsticks. Yummo! I would love to try the Lasagna Rollata al Forno. I LOVE cheese and this is just pasta stuffed with cheese and topped with bread crumbs! All the carbs a girl could ask for! The creamy Parmesan portobello fettuccine, or the Zuppa Toscana with lots of bread sticks or my favorite- the chicken alfredo pizza. I love the OG. I love the portobello ravioli, shrimp mezzaluna, steak gorgonzola alfredo. Those are the stand-bys. I also love trying their special menu items too. Anything with asiago melts my butter!! I would love to try the stuffed chicken marsala. It looks so tasty! Stuffed Chicken Marsala sounds so good to me. I love me some mushrooms! The smoked chicken looks wonderful!! Would LOVE to win this!! Thanks! I guess we can share the appetizers. I want the creamy parmesan portobello fettuccine! Hmmm the smoky mozzarella chicken? I would love the Caprese Flatbread and some hot artichoke spinach dip. Ummm!! I would like to try to stuffed mushrooms! Seafood Alfredo any time!!! Yum ! I want! I want! Paremesean Portobello please! Everything looks so yummy. I have narrowed it down to Capellini di Mare or Seafood Portofino. Hope I win, Yum! Mmmm--That Smoked Mozzarella Chicken sounds so yummy! We just moved and this was the perfect opportunity to find out where the closest Olive Garden is located. Only 15 minutes away!!! Smoked Mozzerella Chicken for me!!! We love olive garden but haven't been in awhile because funds are tight. But my hubby loves the fettuccini chicken Alfredo and I love the chicken con broccoli! I've always wanted to try their pizza. I would love to try their Creamy Parmesan Portobello Fettuccine! Didn’t know they have the new 3 course meal until now! What a great value! I would love to try the Sicialian Scampi. I would love to win! Olive Garden is my favorite! Their soup and salad are my fave! Can't believe the timing of this promotion! I've been seriously lusting after a trip to the Olive Garden, after seeing their new commercials on TV. I'd start with the Lasagna Fritta--it looks delish! But what I'm really jonesing for is the Braised Beef and Tortelloni. If a foot of snow had not just fallen here in Denver, I think I'd have to rush out of the house and get it RIGHT NOW! I'm off to dig out my car...If I can get off my street, perhaps Olive Garden for lunch? Smoked mozzarella chicken sounds so fantastic! i'd like to try the smoked mozarella chicken - sounds delicious! I want to try the three course Italian dinner. I love Olive Garden!! Parmesean Pottobello Fettuccine. I'm a sucker for mushrooms. And pasta. All of it, really! But let's go with the parmesan crusted Tilapia and some bruschetta! I'd get the same thing I always get - The Venetian Apricot Chicken. It's delicious, and healthy! I'd love to try the Chicken & Shrimp Carbonara! Can't wait to try the 3-course meal. Definitely the 5 cheese marinara penne w/shrimp, the 1-of-a-kind salad, & the mouth-watering chocolate mousse. Makes me hungry just thinking of it. Would just have to share with my bff...we always do our "girl time" at Olive Garden! I think the Shrimp & Crab Tortelli Romana looks great! three words: smoked. mozzarella. chicken. Oh, wait, FOUR words: YUMMMMMMM!!! Smoked mozzarella chicken for me! I want to try the new Spaghetti with Four Cheese Meat Sauce. YUM! I am goiing for the Asiago & Garlic Tortellino. Wow -- sounds great! I would like to try Zuppa Toscana. Steak Gorgonzola Alfredo is my favorite! Yum! Anything from olive garden is delish! I'd like to try the Black Tie Mousse Cake because I never have room for dessert when I eat there. I did check-out the menu, but I still think I'd order the Lasagna Classico because I already know I love it! Olive Garden is my husband's favorite restaurant. We really love the breadsticks. and, I look forward to trying some new desserts. This just ruined me! I'm so hungry now. I think I would have to go with the five cheese marinara penne w/shrimp. I would like to try the Seafood Alfredo. The stuffed chicken marsala looks wonderful! I love Olive Garden! The Smoked Mozzarella Chicken for sure. I want to try their chicken Marsala thanks! I love the chicken alfredo pizza and the breadsticks!!! Tweeted about the gift card giveaway! 5 cheese marinara penne with shrimp sounds wonderful. 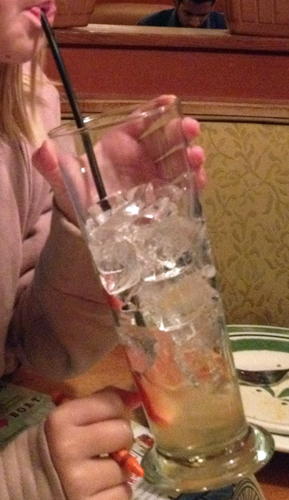 I love Olive Garden! My husband and I don't usually get dessert so I would love to try the zeppoli. They sound so yummy! I love their Chicken Fettucine Alfredo so I will go that. I know its a no brainer but it is so good. Thanks for the giveaway! I want to try the Shrimp Mezzaluna. I would love the three course, and I am seriously craving the gnocchi soup right now! I would love to try the three course, and I am seriously craving the gnocchi soup right now! YUMMY YUMMY! Love to try the Grilled Shrimp Caprese!!! Ravioli di Portobello and salad and breadsticks of coarse! Ravioli di Portobello with salad and breasticks of coarse!! The 3 course meal makes my tummy hungry, that sounds good, I'll have that. I'd like to try the three course special chicken & gnocchi, smoke mozzarella chicken, and amaretto tiramisu. Thanks for the review and giveaway. I want to try the Chicken Alfredo. I would love to have the minestrone soup and breadsticks. Thanks! I always stick with the soup, salad and breadsticks - LOVE! The lasagna rollata al forno. 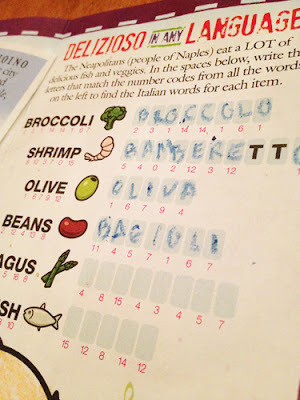 Olive Garden, or O.G. as I like to call it, is one of my fav chain restaurants! That said, I would love to try their new creamy Parmesan portobello mushroom fettuccine! mmmm! I would like to try the Zuppa Toscana!